The winner has been picked, and this contest is now closed. 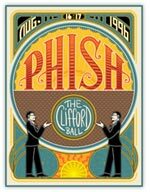 State of Mind is giving away a copy of Phish's latest release‚ The Clifford Ball‚ a 7-DVD box set featuring Phish's first festival‚ which brought over 70‚000 people to Plattsburgh‚ N.Y. in August 1996. It features nine hours of concert and event footage‚ with six complete sets of music and bonus features including Phish's extended soundcheck‚ its late night flatbed truck jam and a 30-minute featurette with exclusive behind-the-scenes footage and more. This regionless DVD set includes options for both stereo and 5.1 Dolby Surround Sound Audio (remixed and mastered from the band's multi-track tapes). To enter‚ fill out the form below by April 16. Good luck!